T.J. Dillashaw is well aware of those who are talking about his weight-cutting progress. Dillashaw is the Ultimate Fighting Championship (UFC) bantamweight title holder, but he’s eyeing another piece of gold. Dillashaw will be challenging Henry Cejudo for the UFC flyweight championship. The bout will go down on Jan. 19 and it’ll headline UFC on ESPN+ 1 inside the Barclays Center in Brooklyn, NY. 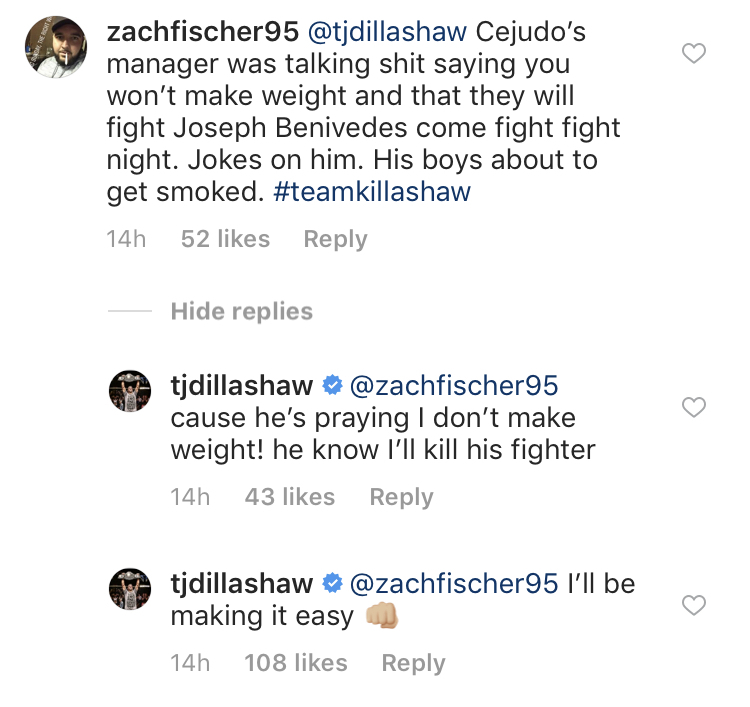 Former UFC flyweight king Demetrious Johnson had expressed concerns over Dillashaw being able to make weight at 125 pounds, which was the reason a fight between them never materialized. It’ll be interesting to see if Dillashaw can make the weight and just how drained his body will be come fight night. Do you think T.J. Dillashaw will make weight, and if he does will he compete at the same elite level we’re used to seeing?